The London/Brighton duo share a dreamy mix to celebrate their upcoming US tour and chat about album number three. The year after Mount Kimbie released their now-seminal 2010 debut Crooks & Lovers, the internet was awash with bumping, bubbling, 2-step-indebted tunes shot through with indecipherable vocal squiggles—but nothing matched the depth, or the lightness, of the reflective, post-club mood of the London/Brighton duo. Kai Campos and Dom Maker had opened up a new, fertile space and everyone rushed forward to fill it. 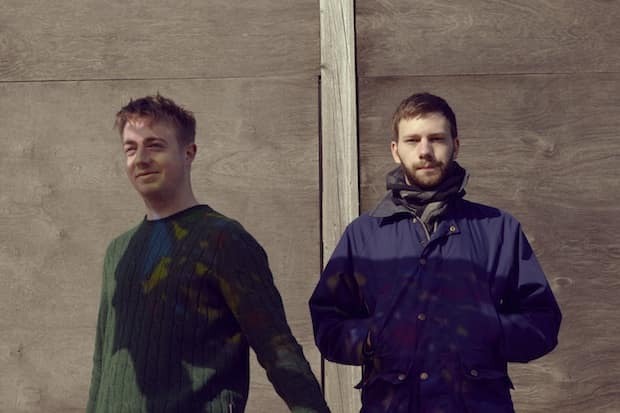 Since then they've not stopped moving, growing into a live band over many months of hard touring and exploring wider musical territories from country to hip-hop (King Krule style) on last year's grower of a record, Cold Spring Fault Less Youth. Today the pair announce a new US tour this August (dates below), share a new mini mix that's a good indication where their head is at (dreamy and free, it seems) and spare a few minutes to talk about album number three. I hear you're working on a new album. How is it going? Kai Campos: Very early days in regard to the new album. Each time you start with an overwhelming number of possibilities and gradually focus in on some thing or form that at some point becomes a solid idea of what the record is. I wish I could go straight to that point sometimes but I guess you'd loose something along the way. There are certain things from the last record that we'd like to carry on and certain things we'd like to move away from, same as each time we approach new work. The process of touring Crooks & Lovers fed into CSFLY, leading you to become more of a 'live' band. How has CSFLY shaped your approach to album number 3? Dom Maker: I think I'm working more with the ideas and sounds of tracks like "So Many Times, So Many Ways," or "Meter Pale Tone" off that album—this week I mean. I bought some old keyboards from the money exchange and they have sparked a lot of ideas in me, just from the factory sounds and beats on them. I never hear the traces of what has gone into each album until long after the writing and releasing of it, so it is hard to tell how our previous has affected us. Kai Campos: Ha, perhaps had to opposite affect. Not entirely but we're still interested in making music that we couldn't really perform in our current live set up. The two things feed in to each other rather than one dictating to the other. We always have to make new adjustments for new material then in doing so end up changing how we perform that material. Will you be hitting the studio while you're over here in America? Dom Maker: Yes, we are going to see friends and work on sounds we've talked about doing. Kai Campos: Yeah, the plan is to smash out some hits while we're over in the land of the hit. You gotta make moves in this game and LA sure is the town to do it. We'll take some ideas and share them with some friends and what not and see if anything catches. What kind of vibe were you going for with this tour mixtape? Dom Maker: Hard to say. The mix is a big mush of sounds from all over the place (anywhere) and I suppose reflects the headspace we are in, what with the album writing. Kai Campos: I think it probably quite well surmises disjointed sounds in my head at this moment. This one's for when you get on the plane feeling rough and put music on and fall asleep and have bizarre and extremely vivid dreams. What's your favourite thing about touring the US? Dom Maker: I love driving there, on the last tour we used a bus to get around and almost every morning would be a different picture, we'd wake up and find ourselves blasting through the desert or mountains or forest or endless plains. Kai Campos: The variety. Some say it is the spice of life. In which case the US is too hot to handle. Cheap, lightweight bank notes that rub off, a general higher standard of Bloody Marys than we're accustomed to in Europe, if you like to wear new, plain white t-shirts then the shopping is fantastic. And the worst? Dom Maker: Well, the end of the tour isn't welcomed, I never feel ready to leave. We've talked about moving out to the states to work on a future album, I'd like to become more familiar with a particular city or state. Kai Campos: Having to constantly turn down or leave food and weed. The people are so friendly but I don't smoke and I don't need to get any fatter. That and the sadness which reveals itself with the fast decay of the products gifted to us by such aggressive capitalism. 1991 - "High Tech Low Life"
Vinyl Williams - "Space Age Utopia"
Dalkavuk - "Baris K Edit"
Tommy De Chirico - "Flower In The Factory"